Earlier this year, Karl, the awesome guy who helped me start this blog, and I decided to split up. Our breakup was just as sweet and amicable as our time together — it was very La La Land minus the snazzy outfits and singing. I moved out of that darling little apartment and said goodbye to my beloved kitchen. Before I go on any further, I have to publicly thank all of the incredible people who helped me with my move. I have more than enough kitchen supplies and dinnerware to stock a restaurant; I needed a ton of help, and thankfully, I got it. I am eternally beholden to these dear friends and family. In addition to moving, that same week, I changed roles at work, which added a generous amount of stress to an already stressful situation. Though I couldn’t be happier with where I am. I feel incredibly lucky to be doing work that I am deeply passionate about for an organization whose mission I love and truly believe in, and I adore my colleagues to pieces. The dust settled, and I considered dating again. The thought alone was initially terrifying. Dating is scary, strenuous, exciting, but also fun, kind of like a SoulCycle class. I went on four first dates, which yielded enough stories for a year’s worth of blog posts. That said, I am no Carrie Bradshaw, so I won’t be sharing any details. Cooking for one has been a fun little challenge. For a short while, I stopped cooking all together. Bell peppers and hummus, as well as Kind Bars and bananas, made frequent appearances on the dinner menu. This recipe arose from a desperate need to quickly cook myself a nice and healthy meal without producing leftovers for days. 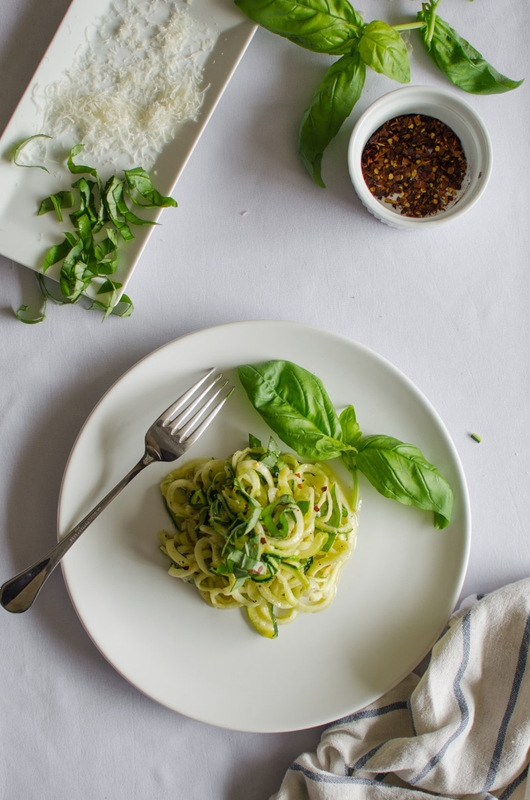 Inspired by the Italian dish pasta aglio e olio, I made these garlic basil zucchini noodles. It’s a delicious and nutritious entree when you add protein to it, like grilled chicken breast, or perfect as is. 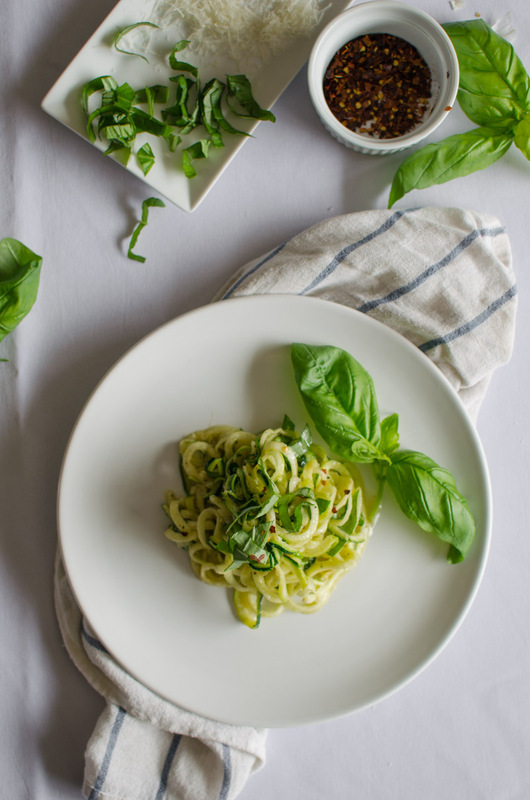 You’ll need a spiralizer for this recipe, and if you don’t already have one, I highly recommend this Chef’n Handheld Spiralizer. 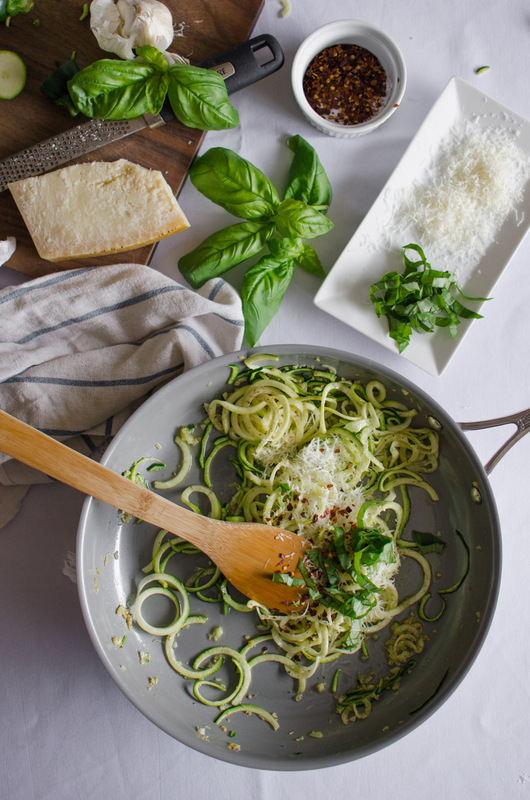 The zucchini noodles are coated in a fragrant garlic oil, then tossed with fresh basil and salty parmigiano reggiano. I add crushed red pepper flakes for a little kick, but you can of course omit this ingredient if you’re not a fan of the heat. 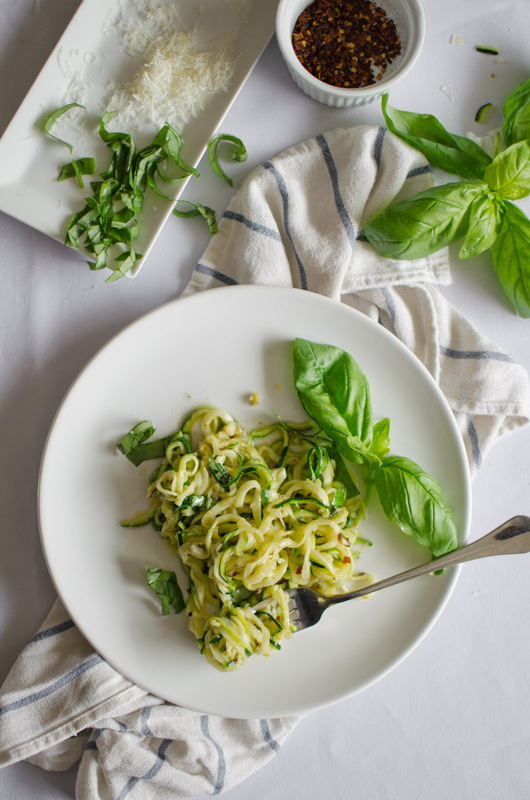 This light dish is fully satisfying and leaves my stomach in a state of perfect happiness. I can’t think of a better summer meal. In a large skillet, heat up the olive oil over medium heat. Add the garlic and cook for about 30 seconds, or until the garlic becomes fragrant. Stir in the salt, pepper, and crushed red pepper flakes, then remove the pan from the heat. 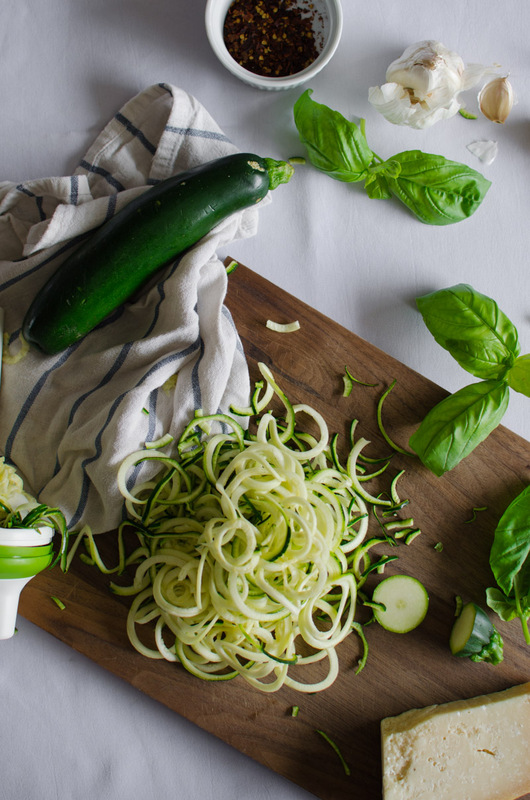 Add the zucchini noodles, and coat in the garlic oil. 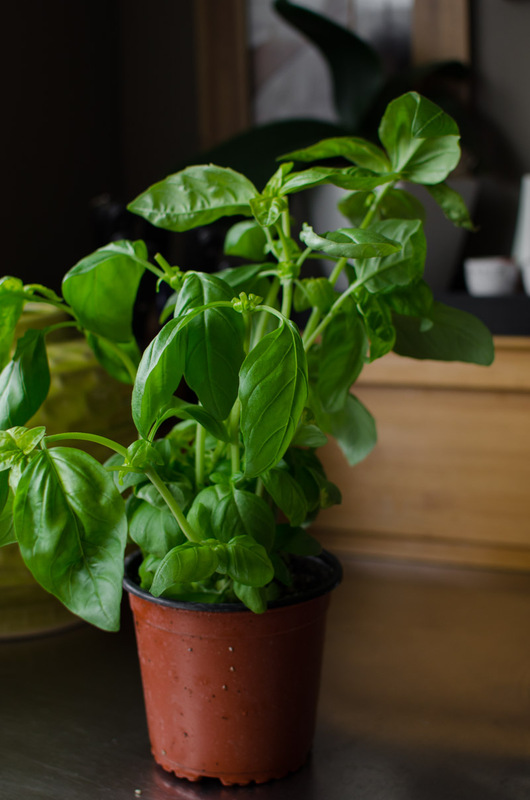 Stir in the parmigiano and basil leaves. Add more salt, pepper, and crushed red pepper flakes to taste. Serve immediately. 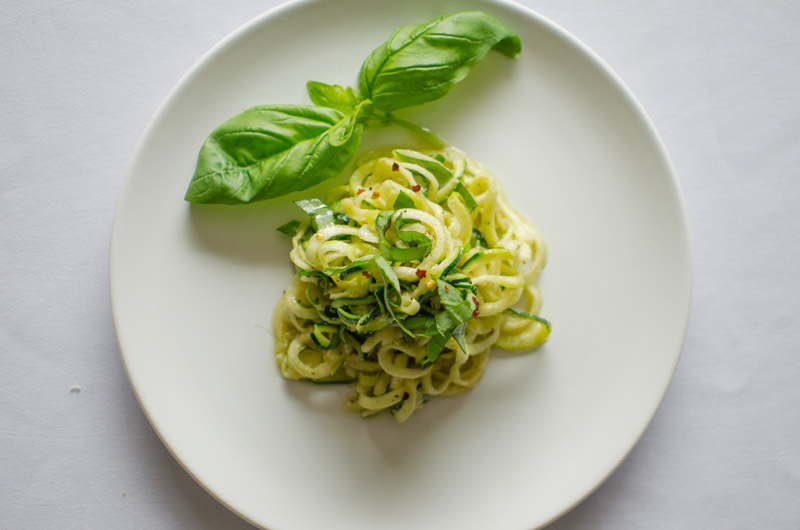 This entry was posted in Entrees, Sides and tagged basil, crushed red pepper flakes, garlic, gluten-free, spiralizer, vegetarian, zucchini. This looks so yummy! It can be difficult cooking for one. I love sharing meals with my loved ones but as someone in a long distance relationship I’m frequently eating leftovers for days.